The French city of Paris, or The City of Love as its often known, is the capital of France and one of the most visited cities in the world. 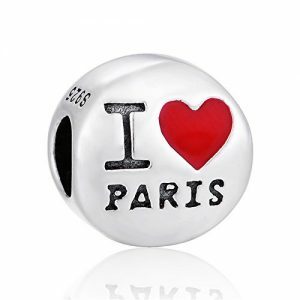 What better way to remember your romantic trip to Paris than with a Pandora Compatible bead or charm depicting one of the cities famous landmarks such as the Eiffel Tower, Arc De Triomphe or The Louvre, or even something simple like an I Love Paris Charm or engraved suitcase bead will bring back those treasured memories. If you are aware of any Paris themed charms or beads that aren’t listed here, please get in touch and we will add them at the soonest opportunity. 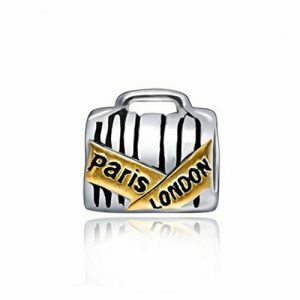 Equally, if you are jewellery designer that makes Paris Themed Charms and would like them listed here then please contact us to discuss how to get your charms listed on the Pandora Compatible website and help gain you some exposure. Paris is not called the city of love for no reason. As soon as you step onto the ground in Paris, you can feel the romance all around. The city reveled in the liberation of romanticism through art and literature in the 19th century. However, it has always been known to inspire love. The opportunities of romance provided by the beautiful city are endless. From cozy siestas in well-manicured gardens to intimate candlelit wine bars, you will be spoilt for choice in the city of love. It’s no wonder why numerous proposals are witnessed at the top of the Eiffel Tower. The 324m astounding icon gives panoramic views of the city, which is simply breathtaking. Top it off with a glass of pink Champagne at the Champagne Bar located on the top floor. For an irresistible experience, try an after-dark ascent. The tower sparkles at the top of the hour every hour. Providing a colorful addition to the night sky. If you are a lover of art, take a stroll through the exhibitions provided by the Louvre. You do not have to be an art expert to enjoy the Louvre. Experience the Mona Lisa first hand and spend some more time taking in all the art that the Louvre provides. It is a perfect museum to spend time, hand in hand with your significant other. The museum is gigantic, and that is an understatement. You can choose to take a map with you if you want to see specific, famous art pieces or get lost in all the wonder. If you are looking for a romantic restaurant to eat at, there are a number of them at Arc de Triomphe. The Arc de Triomphe de l’Etoile is one of the most famous monuments in Paris. If you are a lover of history, this is one of the best places to visit. It has names of all French victories and generals inscribed on its walls. It honors all those who fought in the Napoleonic and French Revolutionary wars. The Arc provides a number of restaurants that will suit all your romantic fantasies. Be it a romantic candlelit dinner with sparkling wine or a cozy afternoon dessert that you can enjoy with your significant other. Paris is full of romantic places to go to and provides an ambiance of love. You are very likely to see couples lying on the grass sharing a smooch or holding hands as they transverse the streets. If you are willing to spend a little more money, check yourself into one of the beautiful hotels that the city provides. Experience a relaxed time with your loved one as you get waited upon and pampered. I promise you will not want to leave the romantic rooms the hotel provides. Paris is a great place for a couple to rekindle their love. If you want to go the extra mile, lavish your partner with gifts, like jewelry from one of the many stores available.